This infographic shows the composition of the Victorian public sector according to these groups. Public service bodies: Departments, administrative offices and VPSC. Public entities: Such as hospitals, TAFE institutes and water authorities. Public entities are the statutory authorities, state-owned corporations, school councils, boards, trusts and advisory committees, established by government legislation to undertake a public purpose. Victoria’s public entities include professional registration boards, advisory organisations, service providers and industry regulators. Major public entities include Parks Victoria, VicRoads, Gordon Institute of TAFE, Melbourne Water, Country Fire Authority, and Monash Health. Public entities cover a diverse range of services, professions and organisations. Examples include the Veterinary Practitioners Registration Board, Federation Square Management, Greyhound Racing Victoria, Dairy Food Safety Victoria, the Victorian Institute of Sport, and small rural health services such as Omeo District Health. Here is a list of employer public sector bodies. Further detail is available in VPSC’s annual the State of the Public Sector in Victoria report. The Victorian Public Service supports the government of the day. It provides policy advice to Ministers and implements government policy. Policy advice provided by public service employees is not the same as policy advice provided by ministerial advisers. Public service employees provide impartial and objective advice. It is often referred to as ‘frank and fearless advice’. Ministerial advisers on the other hand, provide advice that is explicitly political. Ministerial advisers are not public service employees. A list of departments and administrative offices may be found in the Register of Instruments. A portfolio is a Minister’s area of responsibility. It includes the Acts that the Minister administers and the relevant agencies in the portfolio, such as the department and public entities. Departments are the central policy advisers and program administrators for Ministers and government. The role and status of departments is not specified in detail in legislation or the Constitution. In Victoria, some departments advise and support a number of Ministers and ministerial portfolios. The terms ‘central agency’ and ‘line department’ are used to describe the functions of departments. A central agency has whole of government policy responsibilities and includes the Department of Premier and Cabinet and the Department of Treasury and Finance. A line department, such as the Department of Transport, is responsible for policy development, planning and the delivery of specific services. The number and scope of departments will reflect the strategy and priorities of the government of the day. The term ‘machinery of government’ refers to the allocation of functions between departments and Ministers. Departments can be created, abolished and altered by an Order in Council under the Public Administration Act 2004. In Victoria, machinery of government matters – the allocation of functions between departments and Ministers – is the sole responsibility of the Premier. Machinery of government changes are outlined in the Register of Instruments. Administrative offices are public service bodies that are distinct from departments, but have a reporting relationship to the departmental Secretary. The heads of administrative offices are responsible to the departmental head for the management of the office. In some cases, legislation confers certain responsibilities and powers to administrative office heads for which they are directly accountable to the responsible Minister. Staff who work in an administrative office are public service employees. Examples of administrative offices include the Public Records Office and the Environment Protection Authority. 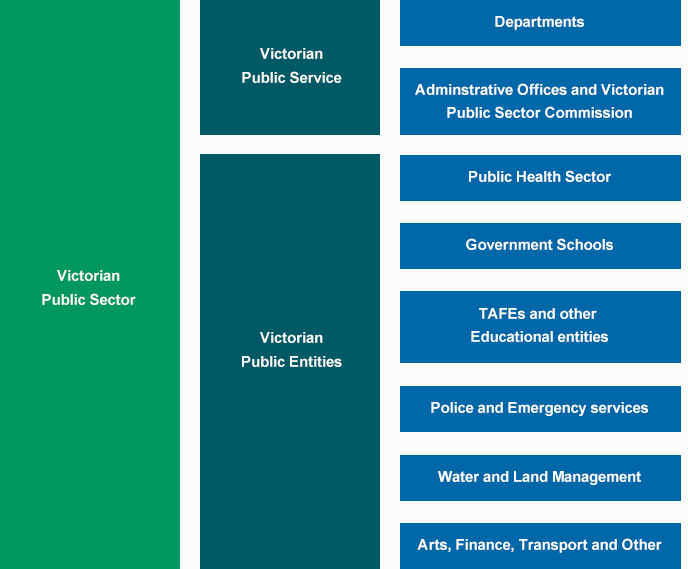 The Victorian Public Sector Commission (VPSC) is neither a department nor an administrative office. It reports directly to the Premier. Within each department, administrative office and the Victorian Public Sector Commission, there is a public service body head who heads the entity. Section 16 of the Public Administration Act 2004 also lists a small number of office holders who have the functions of a public service body head in relation to their own staff. This includes the Auditor-General. In a department, the public service body head is generally referred to as ‘Secretary’. Appointments of public service body heads are approved by the Premier. Key responsibilities of a public service body head are set out in the Public Administration Act. Victoria is governed by a Parliament. This comprises the Crown, which is represented by the Governor, the Legislative Assembly (Lower House) and the Legislative Council (Upper House). This two house system is referred to as a bicameral system. The Legislative Assembly has 88 members who are elected from electorates called districts. The Legislative Council has 40 members elected from eight electorates called regions. Members of both the Legislative Assembly and the Legislative Council serve a fixed term of four years. The government must be chosen from the elected Members of Parliament. The party that has the support of the majority of the Legislative Assembly forms government. It must govern in accordance with the laws passed by Parliament. scrutinises the actions of government. The Victorian Secretaries’ Board comprises the Secretaries of each department, the Chief Commissioner of Police and the Victorian Public Sector Commissioner. The board is chaired by the Secretary of the Department of Premier and Cabinet. The aim of the board is to coordinate policy initiatives across the public sector. It is also responsible for promoting leadership and information exchange in the public service. The board does not have a legal status. The Department of Premier and Cabinet provides secretariat support to the board.